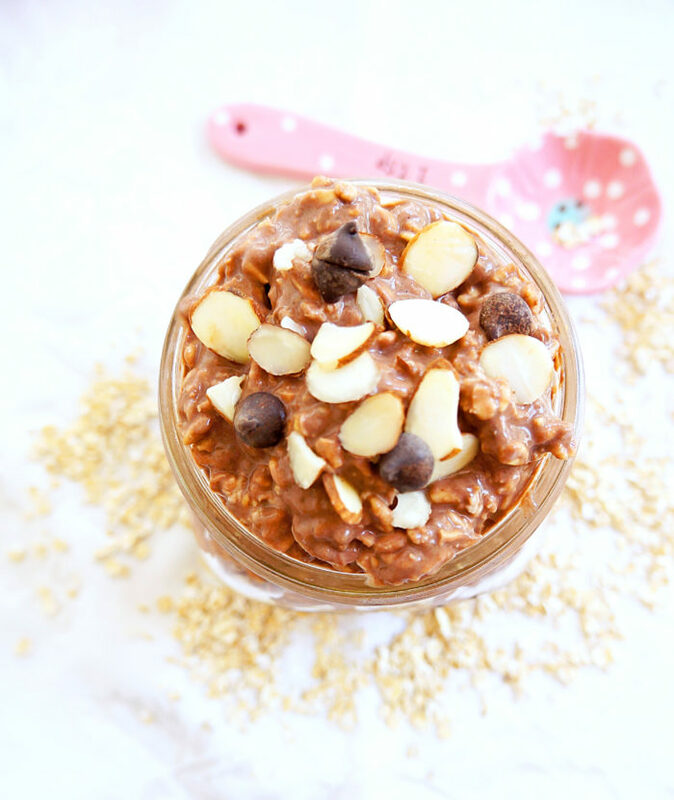 These healthy, yet decadent chocolate peanut butter overnight oats are high in protein, fibre and flavour! You’ll feel like you’re indulging at breakfast! Gluten-free, vegetarian and dairy-free options. So THIS was my breakfast this morning. I’m totally not trying to brag or anything. But man, was it GOOD! I felt like I was completely indulging in this chocolatey goodness in a jar. 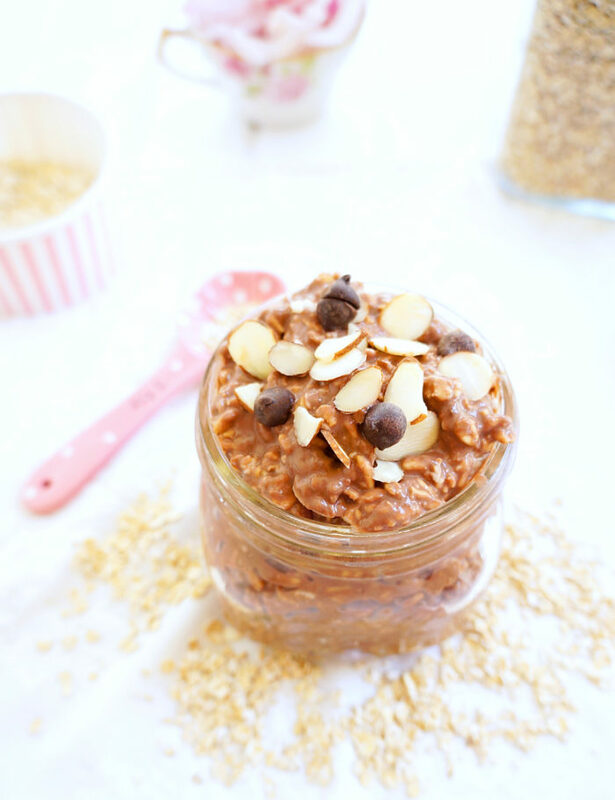 Think.. chocolate and peanut butter infused into oatmeal with a sweet hint of banana. The best part is that I made it the night before in the blender. And then just poured the mixture into jars with oats and stuck it in the fridge overnight. I woke up this morning, and breakfast was there. Staring me right in the face. If you make the whole batch, you’ll have a whole bunch of decadent breakfasts waiting for you every morning. Now oftentimes, I see overnight oats made with Greek yogurt, which is fantastic if you like the taste. In my experience of serving Greek yogurt to countless customers (and witnessing the gag reaction soon after), it’s pretty hard to get people to eat it unless it’s sweetened and every ounce of sourness is concealed. There is, of course maybe the odd person that doesn’t mind the sour taste of eating Greek yogurt plain, but I definitely don’t come across them very often. And of course, part of my mission in life is to avoid dumping a whole bunch of sugar into recipes just to make it taste better. Now without the Greek yogurt, we’d be lacking protein. If you know me at all, I am constantly preaching about the importance of consuming protein, especially at breakfast time for that feeling of fullness and maintenance of lean muscle. So I decided to dump in some pasteurized egg whites. You might have assumed that, but I just wanted to clarify before you got all grossed out. Those egg whites will add that boost of protein we’re looking for without altering the flavour like the Greek yogurt would. Plus, the pasteurization process makes it perfectly safe to consume uncooked. So we dump a bunch of egg whites in…. MORE sweetness from the banana. Which means, no sudden urge to dump in spoonful after spoonful of sugar. AND MORE chocolate and MORE peanut butter flavour to rock your world. 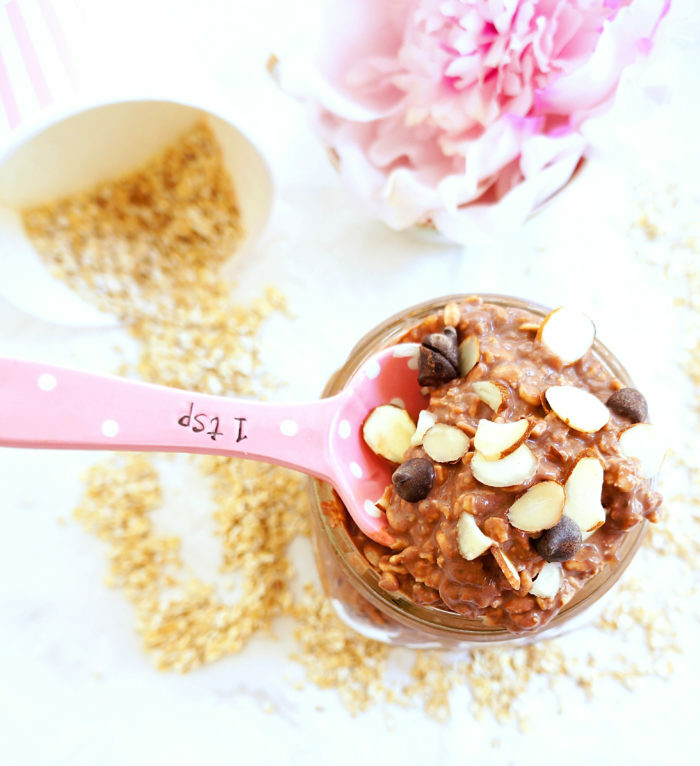 Measure out equal portions of oats into each bowl or jar. Each serving should have ½ cup of rolled oats. Place chia seeds, almond milk, egg whites, vanilla extract, bananas, cocoa powder, and peanut butter into a blender and blend until combined. Evenly pour the smoothie mixture into each bowl or jar with the oats. Give the mixture a quick stir to evenly distribute the oats throughout the smoothie mixture. Place in the fridge, preferably overnight or for at least 1 hour. Remove from the fridge and garnish with toppings of your choice. 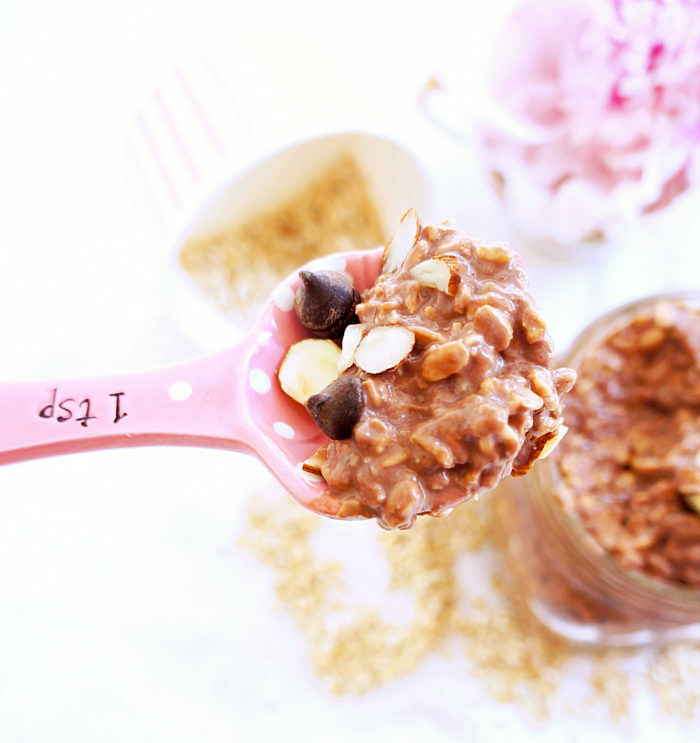 The oats can be eaten cold or heated in the microwave for 30-60 seconds. They will also keep in the fridge covered for up to 4 days. *This recipe is an entry for the So Delicious and Go Dairy Free Snackable Recipe Contest. I am so into this delicious and decadent breakfast. I go thru phases when I eat peanut butter 10 times a day, and now its one of those, I am making a batch for the weekend. You read my mind Amy! I know once September rolls around, everyone will be looking for some quick and easy breakfast ideas to avoid that morning rush ;) Hope you enjoy! It’s my first time here but I must say, you have the most gorgeous design and photography style. I love the amount of light you’ve captured here. May I ask if you use an artificial light? Chocolate and peanut butter anything is amazing! These look lovely! Thanks Rachel..and I agree! No better combo than chocolate and PB! Thanks Paige! I totally agree — no better way to wake up than with the taste of chocolate! 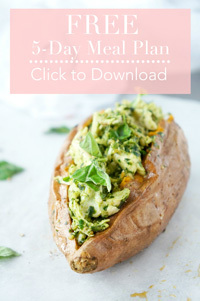 I’ve seen so much of this recipe online (Pinterest and blogs), but never so good looking as this. I think you might have convinced me to try it. Just one question… how long would they last if I doubled the batch? Thanks so much Byron! That’s a huge compliment :) I wouldn’t leave it in the fridge for longer than a week. Personally, the longest I’ve kept the overnight oats in the fridge is for four days. The banana might start to develop a funky taste if you keep it too long. But if you decide to try for longer, let me know how it goes! Oh yum! I bet that these taste so good! And the best part? They are so healthy! I love that! I will be making these for the Hubby and I soon. Thanks so much for sharing! This looks and sounds delicious. I would omit the eggs whites, just out of personal preference. Thanks Charlene! It would definitely still work without the egg whites, you would just want to increase the milk a bit. 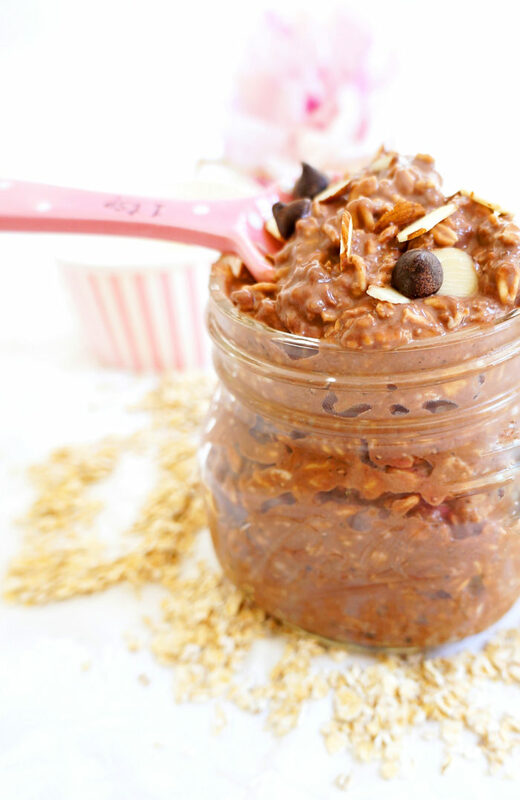 That’s the great thing about overnight oats — they’re so versatile! I am a huge fan of eating oatmeal for breakfast. Plus peanut butter and chocolate is definitely my style! I have never even thought about pasteurized egg whites! My mind is blown right now. PS I am loving your site!